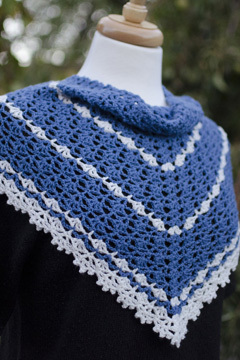 This versatile cowlette begins as a top-down triangle shawl and changes into a cowl with joined rounds near the end, keeping it in place on your shoulders! Made with super fine weight (sock) yarn, it has fabulous drape and just the right amount of warmth! The easy to memorize 2-row repeat makes it a quick and enjoyable project! 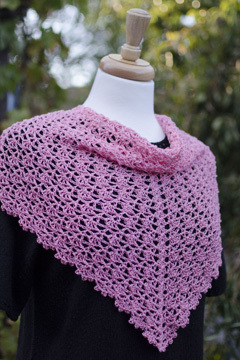 The pattern includes written instructions for both the one-color and two-color cowlettes, front, back and edging photos, as well as 2 symbol crochet charts for the one-color cowlette. Also included are written instructions and a photo tutorial for working the optional bead picots on the last round of the one-color cowlette. Note: Photographed two-color model made with Loops & Threads Woolike in #3 Denim Blue and #21 Ivory. One-color model made with generic acrylic yarn in pink.